In this special issue, we take an in-depth look at the legendary figures who made blues music history. We catch up with Steven Johnson of the Robert Johnson Blues Foundation as he seeks to maintain his grandfather’s legacy. We travel the country, from Piedmont to Chicago, pinpointing the blues men and women who paved the way for future generations of musicians. Elsewhere, we catch up with some of today’s best and brightest blues musicians, like Tedeschi Trucks Band and Adia Victoria. Plus, we give you a behind-the-scenes look at our first Live and In Person Event in Muscle Shoals, Alabama. The iPad version is available at iTunes, and the Android-compatible version is available through Google Play. 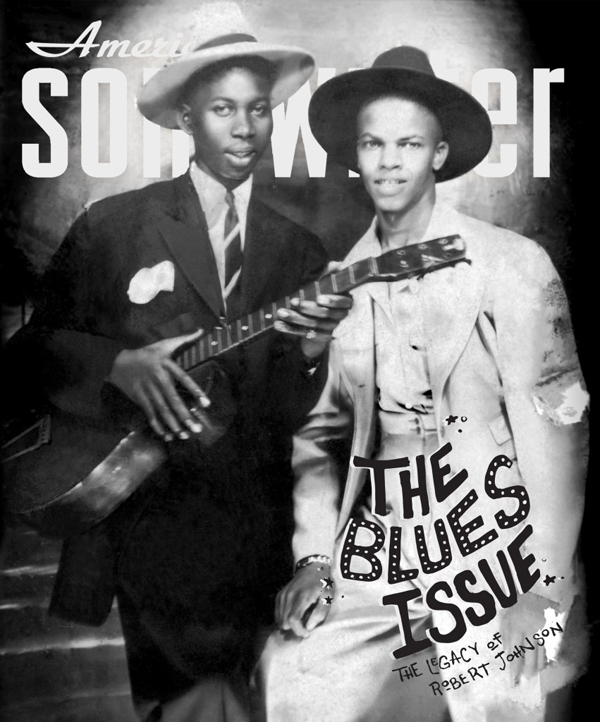 The legacy of Robert Johnson is covered in American Songwriter‘s Blues Issue in May, featuring this photo of Robert Johnson and Johnny Shines on the cover. The Robert Johnson Blues Foundation, which is managed by his family to preserve the music and memory of Robert Johnson through the provision of art education, competitions and scholarships, has long supported the authenticity of this photograph. Here is an excerpt from the magazine, which interviewed Zeke Schein, a Robert Johnson enthusiast and guitar merchant who stumbled upon the photo back in 2005 while looking at vintage guitars on eBay. 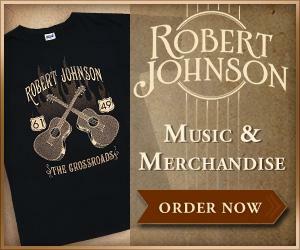 What’s your general take on Robert Johnson in terms of his influence? In my opinion, he was the Jimi Hendrix of his time period. That’s important because what he did was take styles that already existed and sort of combined them in ways that people had not done. I think just like Hendrix coming out of the Chitlin’ Circuit and coming out of the Ike Turner school of guitar playing, Robert Johnson definitely borrowed heavily from people who came before him, but he put it out in a way that was his own and unique voice. I do think it sounds more like Chuck Berry and people who were recording at Chess Studios like Muddy Waters and Howlin’ Wolf. I think it was the origins of what we came to accept as rock music. I think it was very important, and in that time period as important as Hendrix was in the ‘60s for guitar. Read more at American Songwriter. The May/June 2015 issue hits newsstands May 5. In June 1937, Mississippi bluesman Robert Johnson turned up at 508 Park Ave. in downtown Dallas, and that simple act helped put the region on the musical map. For that day and the next, this address — built for Warner Bros. Pictures in 1929 but later used by Brunswick and Decca Records — was where he recorded some of his most iconic tracks, including “Love in Vain” and the haunting “Hellhound on My Trail.” Flash forward 67 years and Eric Clapton recorded tracks for his 2004 Robert Johnson tribute project, Sessions for Robert J, here. In between, 508 Park — an eye-catching, 23,000-square-foot example of early-20th-century art deco Zigzag Moderne architecture — was the place where more than 800 recordings took place of such performers as Gene Autry, Bob Wills, Western swing’s Light Crust Doughboys and conjunto pioneer Lolo Cavazos. Over the years, the 508 Park building and grounds gradually fell into disuse and disrepair. … In 2011 the nearby First Presbyterian Church of Dallas, which also operates the homeless-resource center The Stewpot across the street from 508 Park, purchased the building and grounds. And beginning this year and culminating in either 2016 or 2017, 508 Park will be reopened as a blues and street culture museum, art gallery/studio, screening room, community garden, and performance amphitheater. The entire facility will be known as Encore Park. 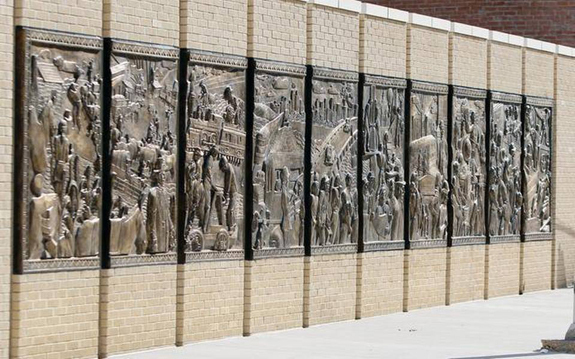 …A recent visit to Encore Park reveals Christy Coltrin and Brad Oldham’s completed The Birth of a City sculpture wall of famous local performers, a nearly finished amphitheater and a gutted interior that has a long way to go. The pull of history is palpable here. It’s in what used to be the film vaults on the first floor, on the upper floors where Johnson and Clapton recorded, and in the scribbles on the walls that remain as mementos from the 1940-60 Decca era. Read more at the Star-Telegram. A three-story art deco structure at 508 Park Avenue in Dallas that sat vacant and dilapidated for 20 years will be transformed into the hub of an event and gathering space called Encore Park. Built in 1929, 508 Park was once occupied by Warner Bros., as a film exchange and studio where famous blues artists such as Robert Johnson recorded. It was previously considered unmarketable, partly because it’s next door to the Stewpot, a community center run by First Presbyterian Church that provides medical services and counseling to Dallas’ homeless population. But the Stewpot bought the property in 2011, and it has been raising funds to create a multi-use social “campus” with a community garden, amphitheater and art space. The first phase of the complex will be unveiled to the public with a dedication from October 24-26. Read more at CultureMap Dallas. 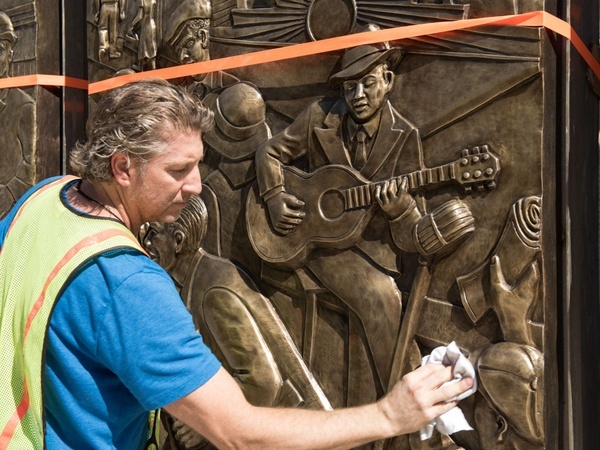 Sculptor Brad Oldham gives the sculpture wall a final polish. Photo courtesy of 508 Park. 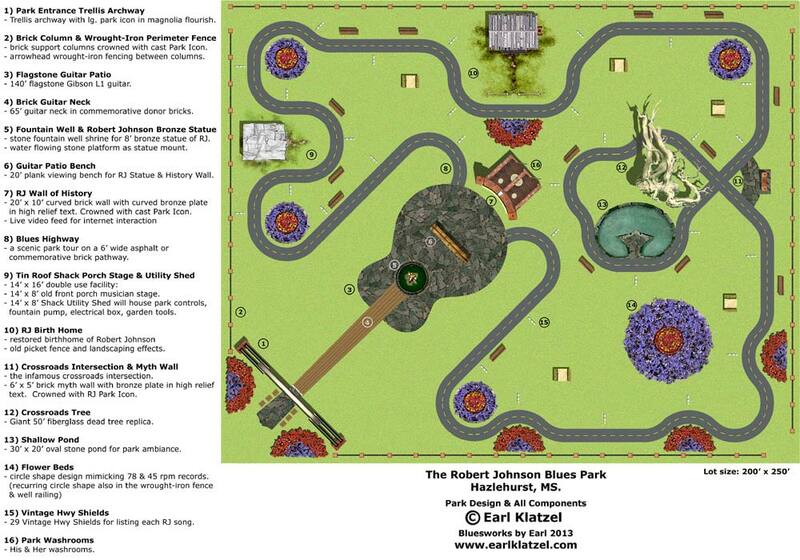 Plans are underway for a proposed Robert Johnson Blues Park to be built in Mississippi. Fundraising for the park, which has been commissioned by the Robert Johnson family and endorsed by the Robert Johnson Blues Foundation, will be announced in the near future. Stay tuned as more details become available. In the meantime, you can view plans for the park, designed by Earl Klatzel.